Newer car models that tout impressive claims about high mileage and low emissions might have you considering an upgrade. While the possibilities of saving at the pump and reducing your carbon footprint may be tempting, you might not be ready to spring for a new car just yet. 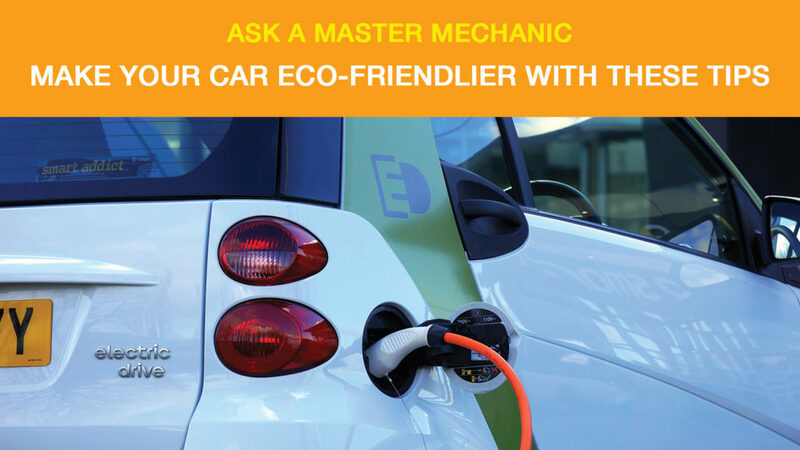 Luckily, there are a few things you can do to make the vehicle you’re currently driving more environmentally friendly. We asked a Master Mechanic and got their top tips! There are tires specially manufactured to be eco-friendlier than standard sets. These tires are often made from synthetic rubber blends that decompose faster and are safer for the environment. They usually also have better rolling resistance to help improve gas mileage and reduce emissions. If your current tires are still in good condition, make sure to keep them properly inflated to maximize their efficiency and the length of their life. This is a relatively simple tip, but one that’s often overlooked. You may not know it but washing your car in your driveway is one of the most environmentally unfriendly things you can do with your vehicle. The water run-off is filled with detergents, road and exhaust residues which end up in the municipal storm drains which head directly to our waterways without treatment. On the other hand, laws require commercial car washes to drain their used water into sewer systems where it can be appropriately treated. Commercial car washes also typically use computer-controlled systems and high-pressure nozzles for the most efficient water usage. It probably goes without saying, but you should try to carpool as much as possible to reduce your carbon footprint. You’ll save in more ways than one by doing so. Not using your car as much will cut down on wear and tear, required maintenance, and lower the number of emissions produced. You can try organizing a carpool program with your coworkers or join one of the already existing networks in Ontario like Car Pool World that pairs you with people with similar commutes. As you drive, your air filter clogs with dirt, dust and debris. This limits the amount of clean air your engine takes in reducing performance. The reduced performance causes the driver to use more throttle to keep up with traffic, thereby reducing fuel economy. When it is time for a new air filter, consider spending a bit extra for a reusable version. Depending on driving conditions, reusable air filters last up to 80,000 kilometres between servicing. These types of filters can be easily cleaned and re-oiled for another 80,000 kilometres of use. They are designed to last the lifetime of your vehicle, saving you money and eliminating the waste produced by replacement paper air filters. Please ensure you follow the cleaning instructions closely in order to reduce your environmental impact. Check Engine Light on ?? Properly maintaining your vehicle will naturally keep it running smoothly, deliver the best fuel economy, and also produce fewer emissions. The check engine light or malfunction indicator light is is turned on when the vehicle’s computer management system detects a system malfunction which can cause excessive emissions. Driving around with the light on, not only means that your vehicle is polluting more than it should, it is also likely wasting fuel. Until you’re ready to upgrade to a hybrid or electric vehicle, these are the best ways to ensure your current car is leaving as small of a carbon footprint as possible. Your local Master Mechanic is always happy to discuss any of these methods and perform any necessary service to ensure your car is running as efficiently as possible. < Summer Road Trip? Save Gas with These Tips!